This is Manu here, bringing you the last post of this month!! The month of Love!!! I hope that you must have had enjoyed the love theme projects showcased this month along with some nice tips and techniques on various products all of which are available at your very own Lulupu Store. I'll be showcasing another fabulous product from Plaid, Mod Podge!! 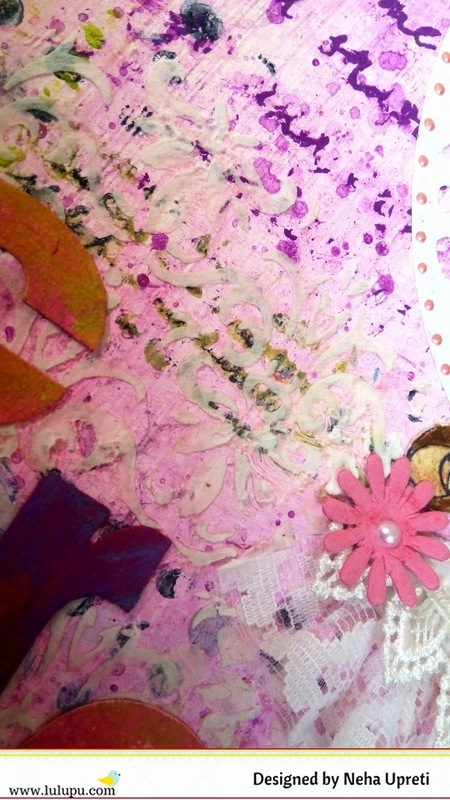 Mod Podge is acid-free and is useful for collages and decoupage as it can be used both to glue something down and as a protective layer over it (instead of varnish). It is available in a lot of variants like gloss, satin, matte, sparkle, outdoors etc. Lulupu has almost all the variants of Mod Podge. I tried out using 2 variants. Mod Podge Satin Finish and Mod Podge Dimensional Magic and loved them both. Here's what I did with the Satin finish, I decoupaged a three drawer Chester. The Mod Podge Satin was used to stuck the paper papers to the Chester and then once it dries out a nice generous layer of Mod Podge was applied to the pattern paper to give a protective layer! 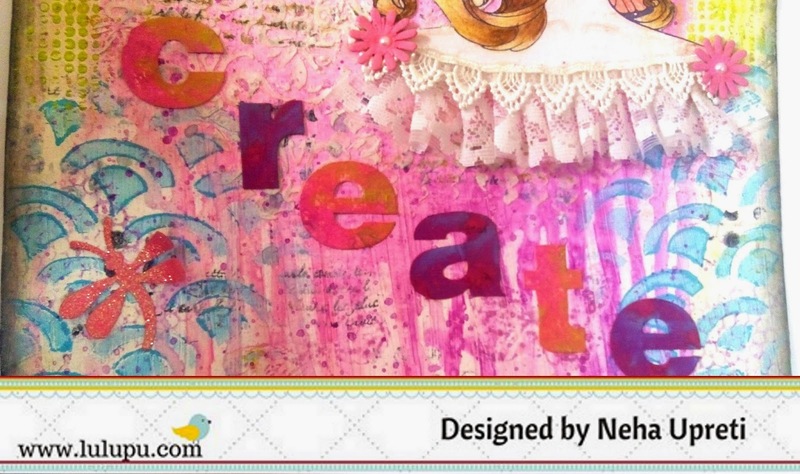 I have always loved doing decoupage for the fact that Mod Podge is so versatile. There are many variants and it's fun to try them all out. 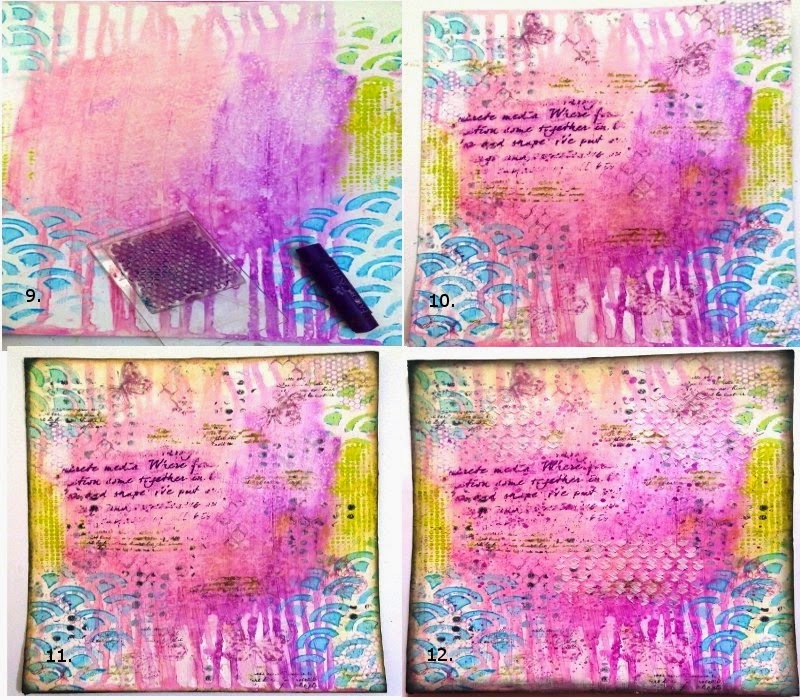 In addition to the Mod Podge Satin, I also made some fun things with Mod Podge Dimensional Magic. Now, I love this one because the possibilities with this variant is endless. It creates an epoxy like finish on the surface that makes it three dimensional to look at. Here are some Fridge Magnets made using the Dimensional magic. Now do tell me that this is one cool thing to make!!! 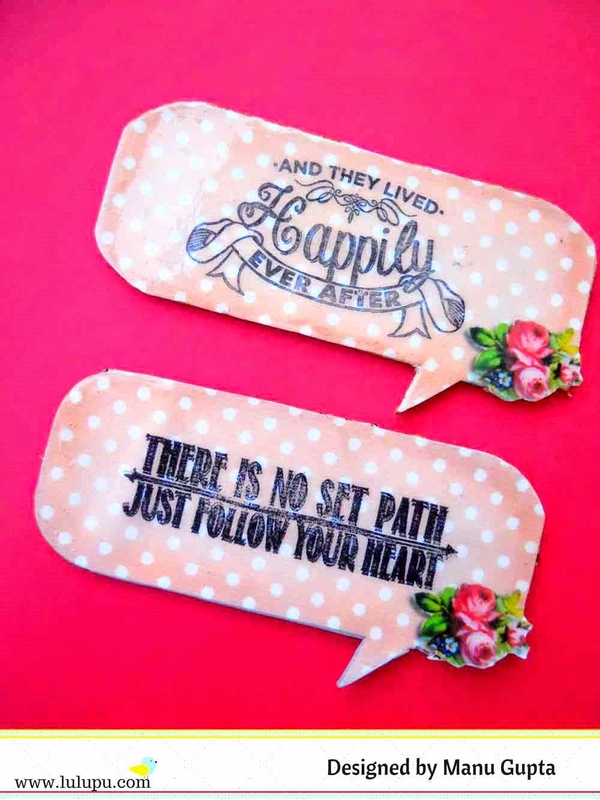 I had initially thought about keeping them very simple with just keeping the text to bare minimum of Live, Laugh, Smile, but then one look at that wonderful MFT Love Story stamp, all my plans went bonkers and I grabbed this pretty stamp set to put in some lovely lovey dovey text!! Here are some snapshots of all the four magnets, they are now happily stuck up to my Fridge!!! After sticking the stamped bubble pattern paper to a chipboard, with Mod Podge Satin, I let it sit dry and then gave a lavish coat of the Mod Podge Dimensional Magic to get that 3D look. I love love love them!! I hope you go out and try out this fun product from Plaid and do not forget to share your lovely creations with us. Ohh, also do remember to link up your entries for the Feb challenge 'You are Sweets' here. Love Story Clearly Sentimental Stamps 4"X6"
18 Sweet creations, hopefully there are a few more waiting to be uploaded. I hope you are all enjoying the new format of our challenges and also enjoying the Design Team tips, techniques and product highlights. For my post today, I'm showcasing two wet media that I use very often in my mixed media layouts - texture paste and black sand. Most of the time I just use texture paste as is through a stencil, so this time I tried two new techniques and loved the outcome. The base for my layout is tissue paper stuck on Kraft cardstock. Next I mixed texture paste with gesso and spread it on the layout leaving a border of about an inch on all sides. Using a brayer and palette knife variably gave a very interesting texture. When my last layer of paint was almost dry, I applied some more texture paste through the Prima crackle stencil to break the monotony of the painted background - exactly the effect I was after. To give the background contrast, I wanted to introduce black. My go to technique for this is usually stamping with black archival ink. But, this time I used black sand mixed with black gesso for a jet black look on non- gessoed canvas (one of the layers behind the photograph) and also on a few places on the layout. Hope I've inspired you to try these media and if you already do, then, to try a different technique. Drop me a word or two on how you use them in your art work and Id love to read it. Don't forget to link up your creations for the 'Love you Sweets' challenge by the end of this month - only 4 days including today. Lattice Texture Clear Stamps 2"X5"
Rocks Texture Clear Stamps 2"X5"
Journal Texture Clear Stamps 2"X5"
Labels: Kripa, Mixed Media, texture paste. I hope that you all are enjoying our this months 'LOVE' theme projects!! Do remember to participate in our challenge for this month here. 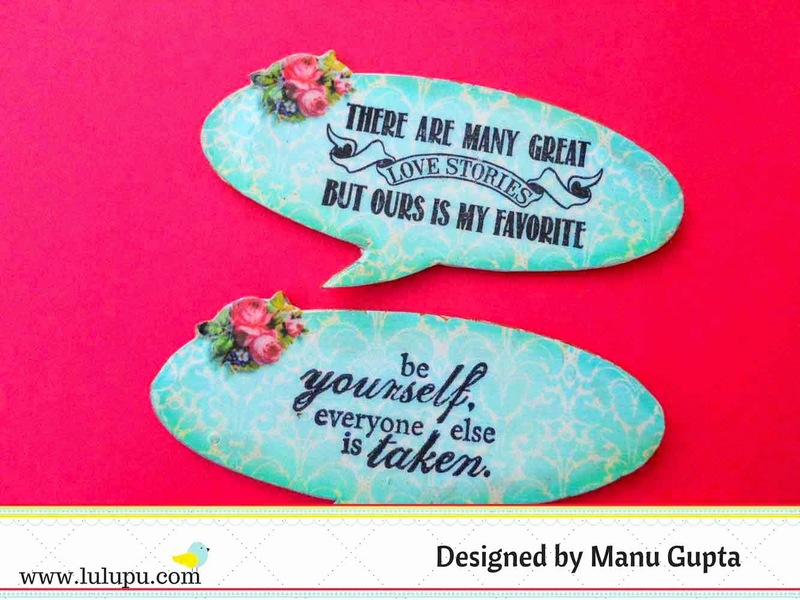 Here's another inspiration from our Guest Designer Mukta from Mukta Creations . Lets checkout a little more about her before we move on to see her inspiration. I am from Mumbai . I have a very small family ..me my husband and two kids ...my husband is a captain in merchant navy...and I am a teacher (b.ed), (teaching science and maths till 10) diploma holder in fine arts, diploma in yoga and an interior decorator, (nothing relate with each other lol).. I think in India each kid is a crafter ,kids use to do origami even I started like that .i was a boarding student so most of the time busy in school.but I became serious when I was in 9th..I started painting that time ..and started crafting @ the age of 15 with some jute ..made so many projects out of jute ..
now a days you can say card making ...but I never stick with a particular style ..I love to try different style..
crafting from last 17 years and paper crafting from 6 months back .. 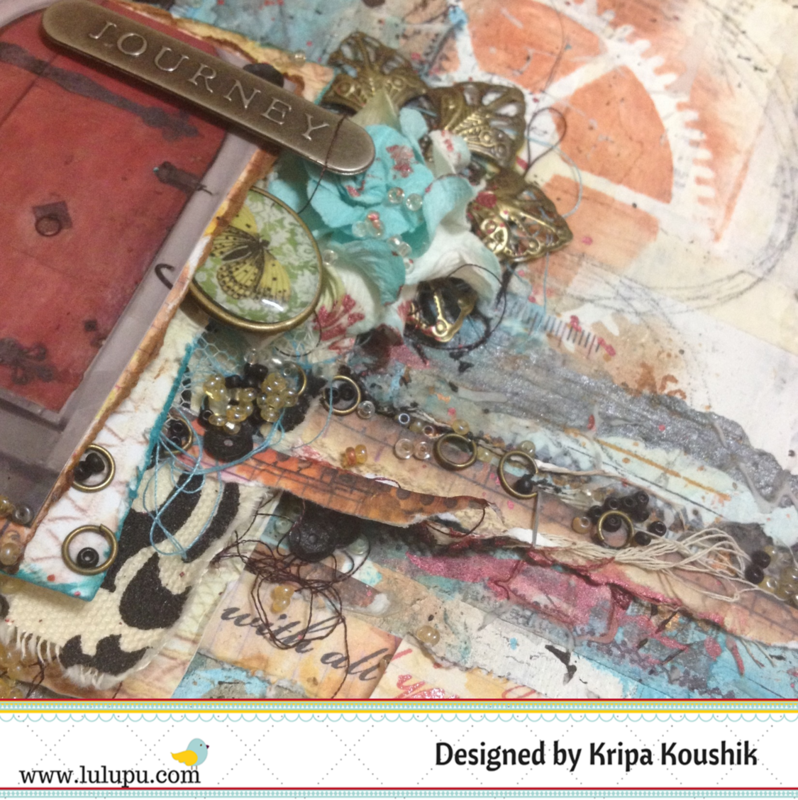 I love mixed media but unfortunately don't have so many on my blog...love making layouts .. I make cards regularly .....altering some boxes ..and a layout .. It was great knowing a little more about you Mukta! Here's what she has made for us! For this i used digi stamp . After stamping i draw two lines with the help of ruler..
Then i drew some circles (randomly) in different size and colour with copics.. 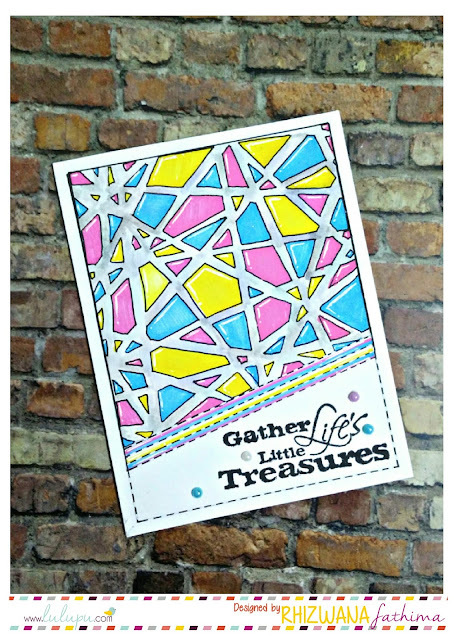 It's really very simple and fun card with very less supplies.. I hope you like it.. I hope you enjoyed this card, it's very simple and easy to make, yet the glossy accent does it bit! It sure makes this card a pretty one to look at ! 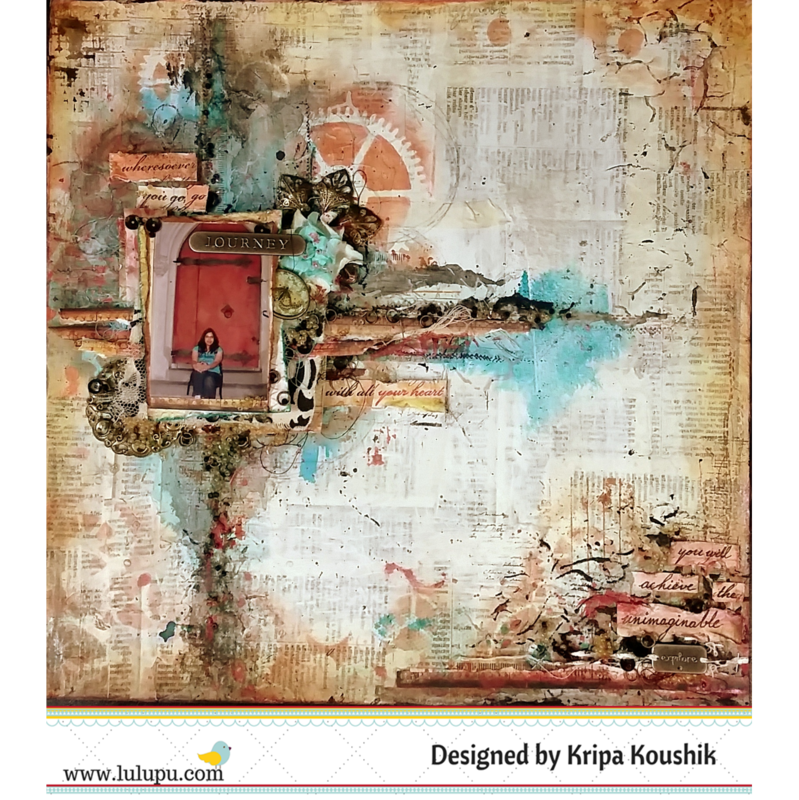 Neha here, today I am sharing with you a mixed media canvas using different techniques with Gelatos. Gelatos are creamy, compact pigment sticks that glide easily onto paper, canvas, wood, and more. 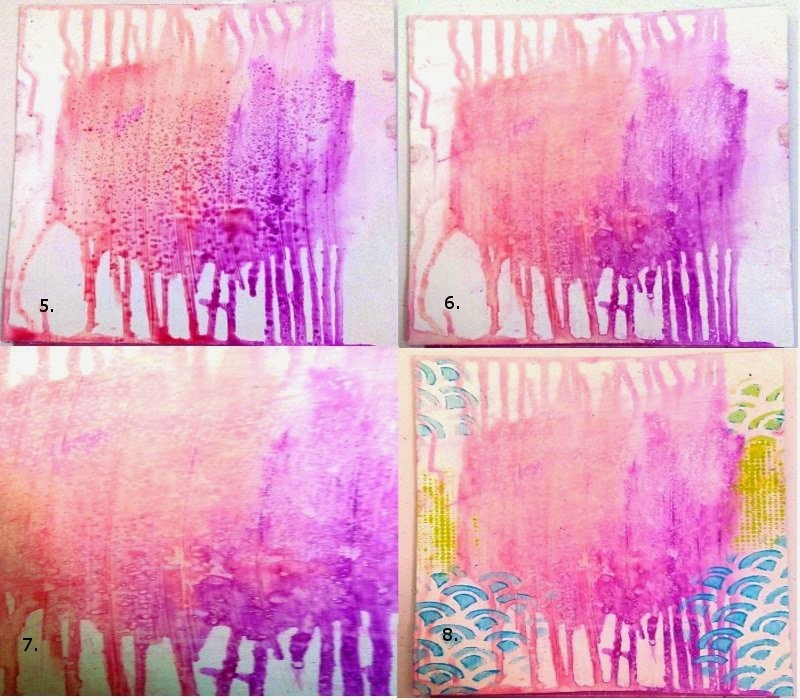 They give vibrant color and coverage and can be used dry (you can blend them easily without water by just using your finger) or dissolved with water to create cool watercolor effect. 1. I started with a thick chipboard and gessoed it. It gives a smooth and even background for the base. 2. Next I scribbled Raspberry and watermelon from Gelatos Mix and Match tropical set in the middle of the canvas. 3. Sprayed some water over them using mini misters. 4. As gesso offers resistance, the gelatos simply dilute and pour down the canvas beautifully - rather than absorbing into it and appearing like blobs of color. I did the same in opposite direction also. 5. Sprinkled some salt to give it more dimension and texture. 6. When it dried, just removed it with a tissue paper. 7. You can see the effect of adding salt. 8. Next I used gelatos Margarita mix and Snow cone through different stencils and just blended them with fingers before lifting up the stencils. 9. You can also use Gelatos for stamping. Just spritz some water over the stamp, rub gelatos over it and stamp the image. The image is subtle and not sharp like you would get with ink. 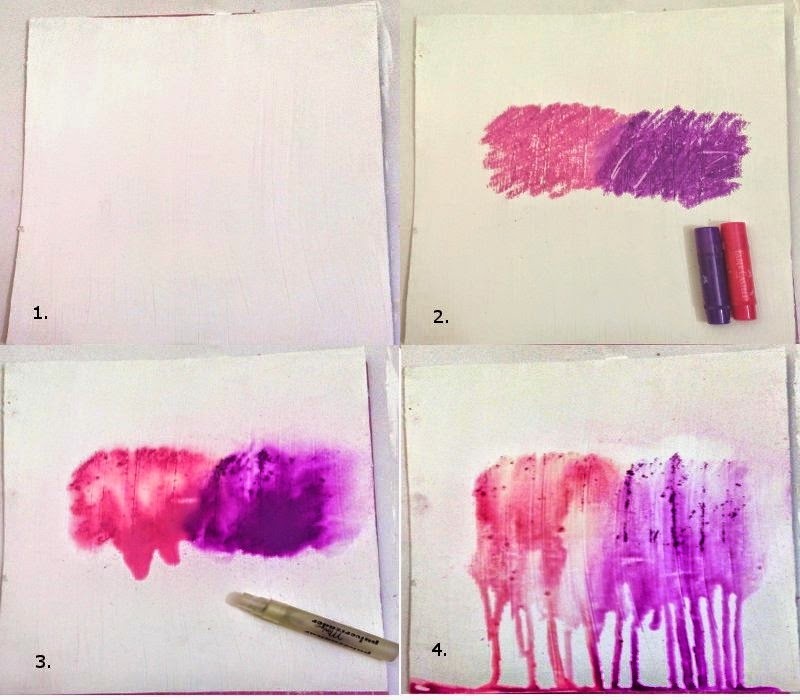 If you want a soft watercolor effect, this is a great way to go. 10. I used a couple of texture and script stamps from Bo Bunny and Butterfly stamp from Kaisercarft. 11. Then I used DIs Black soot and Vintage photo at the edges. 12. 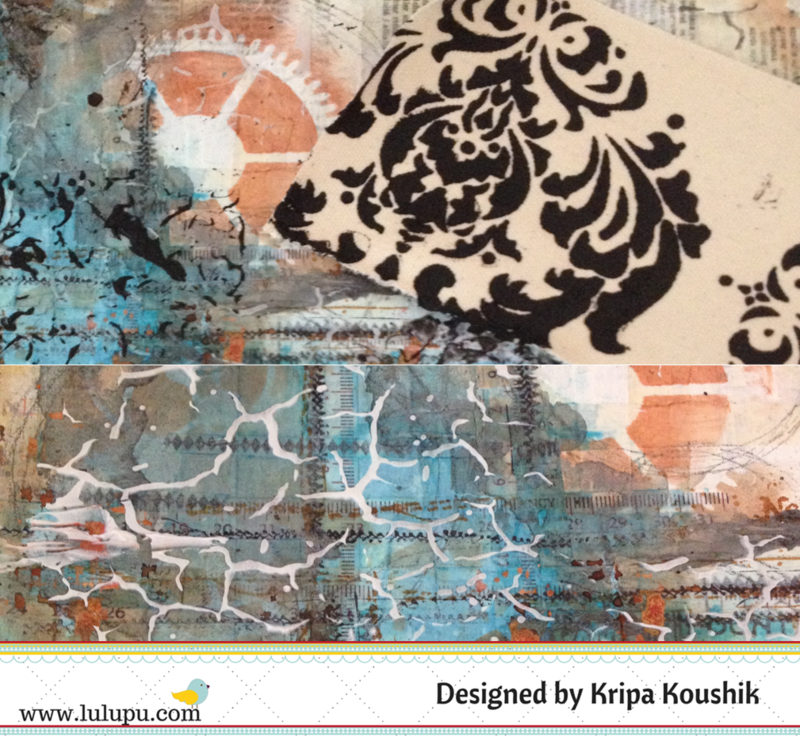 Added some more texture using Texture paste and stencils and our background is ready. Now you can apply gel medium over the canvas if you want this background to be permanent or otherwise don't wet this surface further. When gelatos color dries completely they become archival. Embellished it with some diecut, stamped and colored image- Prima bloom girl- Sharon, chipboard letters and some butterflies. 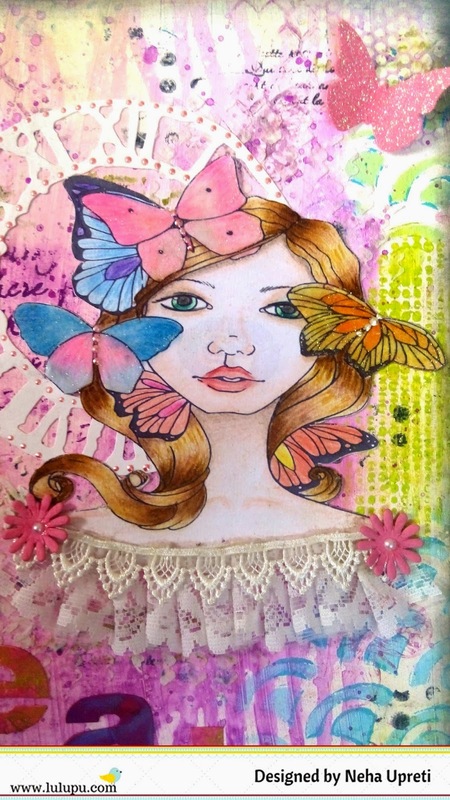 I have colored the image with pencil colors, sketch pens and gelatos (butterflies). Chipboard letters also have been colored with gelatos (rubbed over it and blended with fingers). 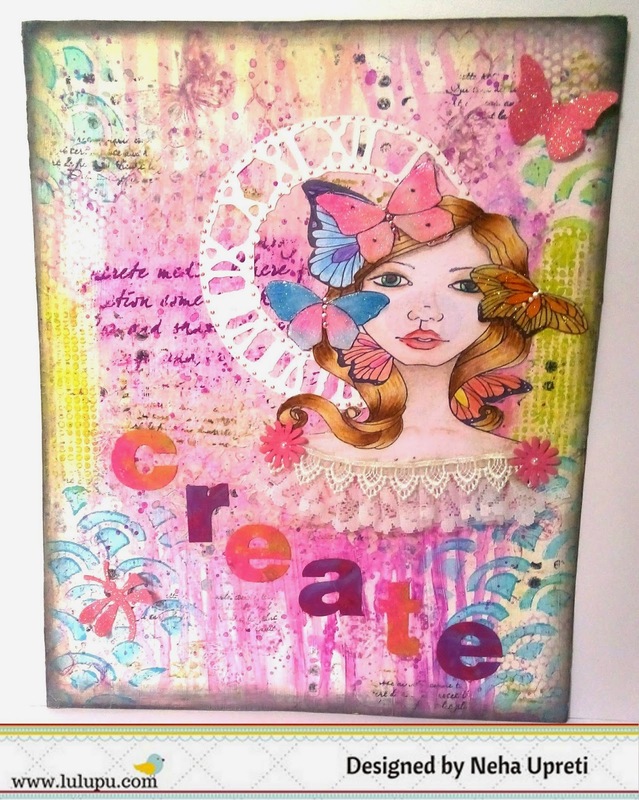 Used stickles over the butterflies on the image and then coated them with glossy accents. Also used Liquid pearls over the die cut clock. So guys!! I hope I have inspired you enough to work with Gelatos. They come in a wide variety of colors which are available here.